Let me start by saying that I am a fan of apocalyptic fiction. I love a good tale of the end of the world, whether by disease (The Stand), nuclear war (One Second After), zombies (World War Z), alien invasion (Footfall), cosmic disaster (Lucifer’s Hammer), or anything else suitably dire. 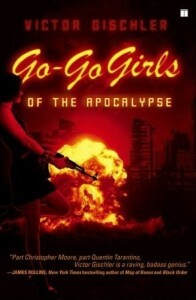 “Go Go Girls of the Apocalypse” is not exactly one of those tales.